Bigbury Mint offer a quality medal repair service catering for non-silver and silver repairs. Our qualified silversmith will assess any medal sent to us for repair and we will then provide a quote over the phone (written if required). Although the majority of official military medals are made of metal and are therefore quite robust there are certain points of weakness. 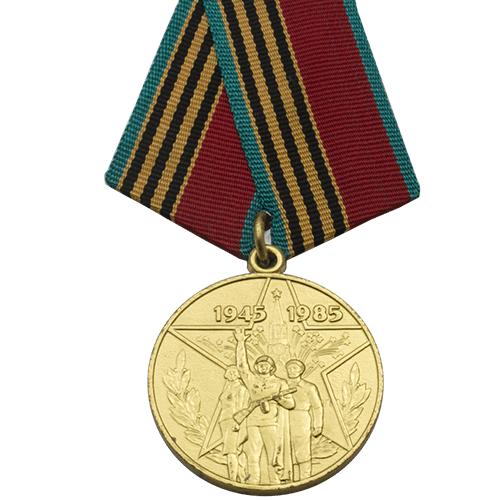 Official General Service Medals, Campaign Medals and certain Long Service medals have a swivel suspension attaching the ribbon to the medal. Over time and a certain amount of rough handling the swivel point can become damaged. This is noticeable as the medal is harder to rotate about the swivel. Eventually the swivel breaks and the medal coin is then loose. The medal can be repaired by fitting a new suspension. Although the ability to rotate the medal is lost, the medal coin would be re-united with the suspension allowing the medal to be worn again. An Example is shown in the image to the right. Other official military medals (Golden Jubilee medal for example) are plated with a layer of metal which covers the original base metal. Rigorous cleaning and element damage can result in the plating wearing thin causing the base metal to show through. A repair of this type involves the medal having to be re-plated in order to restore the medal to it’s original glory. Another common medal repair is the replacement of the suspension rod or ring which allows the medal ribbon to be attached. These parts of the medal can become misshapen or break completely which means the ribbon can no longer be attached. In this instance a new rod or ring is fitted. Other types of medal repair are available and the quickest way to find out if we can repair your medal is to send us an image via email. We will take a look and call you or email you to discuss your medal repair options. If we are unable to repair the medal we will always try and offer good advice giving you all the options available. Unfortunately we cannot accurately quote for a medal repair until we have assessed the medal. Please see our Sending Medals page for further information.